Just as the official story encapsulated in the NIST report fails under scrutiny when sound physical concepts are applied which illegitimatizes overreaching critical assumptions, concepts within the 9/11 truth movement must similarly withstand intense scientific scrutiny. I do not endorse the NIST report as a whole, but find sections of the report well conceived. I currently find no reason to reject the finite element impact analysis of a Boeing-767 with the WTC towers based upon flawed methodology, misguided assumptions, or contradictions with observation. Within this letter, I will use the NIST impact results to illustrate the flawed methodology employed by many proponents of the ‘no planes’ theory, namely the mischaracterization of the plane deceleration during impact and confusion between instantaneous versus average velocity and deceleration. Proponents of the ‘no plane’ theory claim that videos showing the aircraft deceleration from both planes during impact with WTC 1 and WTC 2 are much too small. They conclude that this is unphysical, especially in light of the fact that NIST allegedly reports zero deceleration of the aircraft in the case of the WTC 2 impact (3). Videos of the impact only show the part of the aircraft visible outside of the exterior walls which, admittedly, does not appear to decelerate appreciably. The center of mass of the airplane, however, decelerates considerably. 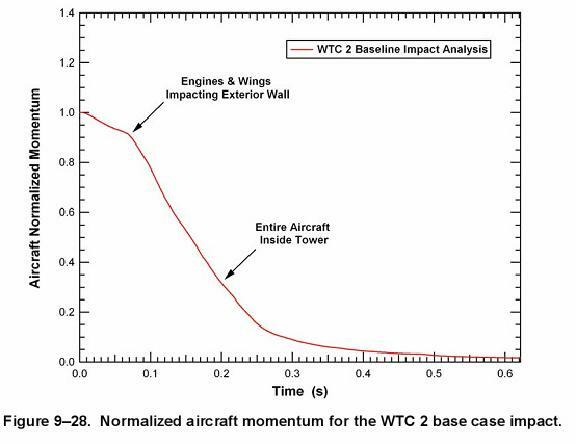 Figure 7-34 taken directly from NCSTAR1-2 (where I have added the “75%” label as well as a phantom plane at 0.2 seconds)(1) shows the NIST modeled impact of a Boeing-767 with WTC 2. In the ‘base case’ scenario, the initial velocity of the plane just before impact closely matches measurements obtained from multiple video sources, namely 542 MPH. The tail end of the plane moves one plane length, 159 feet 2 inches, during a time interval of 0.2 seconds which yields an average velocity of 541.5 MPH. A very small change in velocity of the tail end is not unexpected. Analysis of an F-4 Phantom jet aircraft impacting a massive slab of concrete at Sandia National Laboratories shows no loss of velocity of the tail end during collision within the measured error (see appendix for details). However, this miniscule deceleration does not represent the deceleration of the entire airplane, only the tail end. The center of mass represents the motion of the entire airplane. Since the front of the aircraft decelerates faster than the tail due to impact, the center of mass shifts towards the tail end. Therefore, the center of mass of the plane travels less distance than the tail. Using Figure 7-34, one can see that the center of mass only travels approximately 75% of a plane length over 0.2 seconds which represents an average velocity of 406 MPH. This results in an average decrease in velocity of 406/542 = 25%. 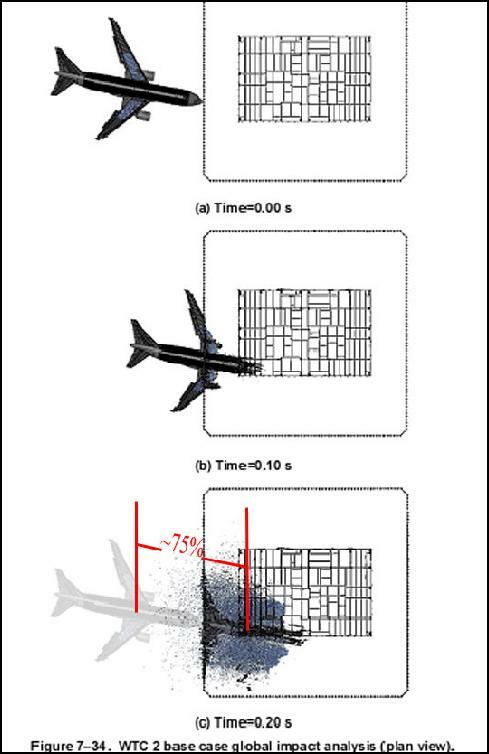 NIST derives from their simulation the spatially averaged momentum of all the thousands of pieces of the airplane generated by the impact and is summarized in Figure 9-28 published in NCSTAR1-2B (2). The graph shows what is commonly called the ‘instantaneous’ momentum of all the plane parts. That is, the momentum (equivalently the velocity since mass is conserved) at any instant in time of the center of mass which can be read directly from the graph. If we find the average height of the graph over the time interval from zero to 0.2 seconds, we can obtain the NIST reported average change in velocity of the center of mass. This is accomplished by using calculus: calculate the area under the curve between zero and 0.2 seconds and divide by 0.2 seconds. This yields an average decrease in velocity of the center of mass of 25% which agrees with the analysis from Figure 7-34. It should be noted that the net decrease in velocity obtained from the graph at 0.2 seconds is 70% representing a net loss of 91% of the aircraft’s kinetic energy. 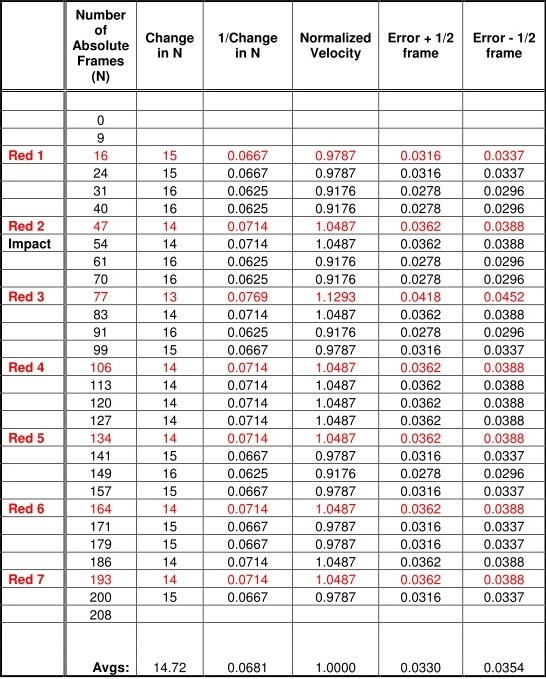 In summary, the NIST impact simulation is clearly self-consistent, appears to not violate any laws of physics, and closely matches observation. Immediately after the entire aircraft passes through the exterior wall, the net reduction in velocity of the aircraft as reported by NIST is obviously 70% representing a net loss in kinetic energy of 91%. An analysis of a crash test of an F-4 Phantom jet aircraft showed no appreciable deceleration of the tail end during impact with a massive concrete slab demonstrating that little deceleration is expected from the tail end of a Boeing-767 during impact with a WTC tower. Sandia National Laboratories conducted a crash test of an F-4 Phantom jet impacting a massive concrete block in 1988. Picture 1 is a still frame from the video segment used in the analysis with an added overlay of blue and red equally spaced vertical lines. Although this particular segment is running in slow motion, Sandia reports that the initial velocity of the plane before impact was 480 MPH (http://digitalops.sandia.gov/Mediasite/Catalog/catalogs/History). The absolute time measured in units of frames (1/30 of a second) when the tail-end was aligned to each vertical line is tabulated in Table 1. Since the error bars are quite large (+/- ½ frame), the time differencewas calculated between every 2 vertical lines. For example, in Picture 1, the time difference calculated at the first red vertical line is taken as the time it takes for the tail-end to traverse both adjacent blue vertical lines, and the result placed into the row labeled “Red 1” in Table 1. Picture 1: F-4 Phantom jet impacting a massive concrete block (far right). 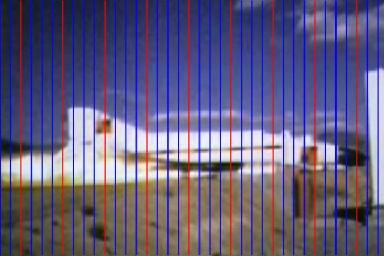 Equally spaced blue and red vertical lines are overlayed on the original video footage. Since velocity = change in distance / change in time, and the distance is constant (the distance between every other vertical line), the relative velocity ~ 1/change in time and is tabulated in the third column of Table 1. The average of this column is computed and is used to normalize the data, resulting in column 4. The resulting graph of the normalized velocity is shown in Figure 2. 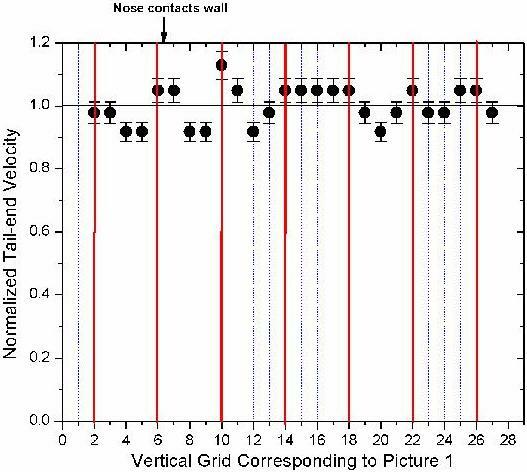 The red and blue vertical lines in the graph correspond with those in Picture 1 (left-aligned). An arrow marks where the point of impact begins. Each data point should be thought of as a rolling average over the distance of 2 units of the x-axis. Data could not be taken for the last 20% of the impact since the tail was obscured by debris. No change in velocity was measured before or during impact to within an error of 3%. Table 1: Calculating the F-4 velocity. Each row corresponds with each vertical line in Picture 1. One frame = 1/30 second, but the original film was in slow motion. Initial plane velocity was 480 MPH. Figure 2: Normalized F-4 tail-end velocity shows no change within error before or during impact. The red and blue vertical lines correspond with those in Picture 1 where x=0 corresponds to the left edge. Each point represents the 'rolling average' of width 2 units. Initial plane velocity was 480 MPH. A horizontal line is drawn at the value 1.0 as a guide for the eye. 1.Figure 7-34 from NIST Report NCSTAR1-2: Center of mass of the plane is estimated before and after collision. The separation between the two points is only ~75% of the initial plane length. 2.Figure 9-28 from NIST Report NCSTAR1-2B: The below graph represents the instantaneous momentum (or velocity) of the Boeing-767 center of mass.